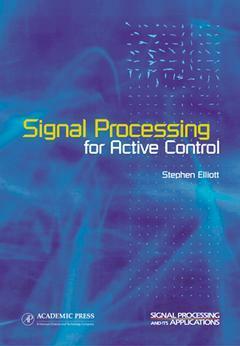 Signal Processing for Active Control sets out the signal processing and automatic control techniques that are used in the analysis and implementation of active systems for the control of sound and vibration. After reviewing the performance limitations introduced by physical aspects of active control, Stephen Elliott presents the calculation of the optimal performance and the implementation of adaptive real time controllers for a wide variety of active control systems. Active sound and vibration control are technologically important problems with many applications. 'Active control' means controlling disturbance by superimposing a second disturbance on the original source of disturbance. Put simply, initial noise + other specially-generated noise or vibration = silence [or controlled noise]. This book presents a unified approach to techniques that are used in the analysis and implementation of different control systems. It includes practical examples at the end of each chapter to illustrate the use of various approaches. This book is intended for researchers, engineers, and students in the field of acoustics, active control, signal processing, and electrical engineering.